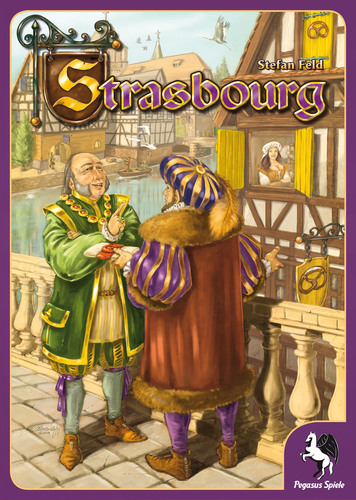 Strasbourg is a game that published by Pegasus Spiele in 2011, designed by Stefan Feld (the man behind In The Year of The Dragon, Macao, Notre Dame, Luna, Die Burgend von Burgund and many more). This game is quite new and not many gamers know about it, and how good this game is. It should deserve more spotlight. Strasbourg in the 15th century – the political skills of the city are heavily influenced by the craftsmen guilds . In this time, players take on the lead of ascending families of the city. It is your goal to place your family members in the different guilds. Only the clever usage of influence points makes it possible to be accommodated as apprentice, assistant or even master craftsman – provided you can pay the admission fee. But don’t underestimate the power of the church or the nobility. I noticed the game from boardgamegeek.com and curious about it, so i read the rules first and it was quite unique and attractive. One of my friend has the game and we played it recently, from the first play i instantly like the game. This review is made based on my 2 game sessions, hopes this cover all of the game aspects. 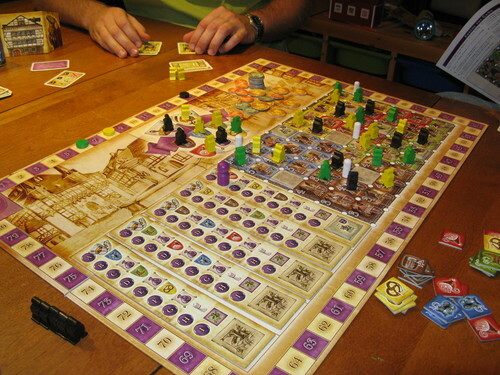 As like many Euro games, Strasbourg offers you typical theme which lies not too important in the game. I often found the theme of Euro games rather similar, and this game is not an exception. Players are noble citizens that try to get into the council of Strasbourg with their influences and other things. They will try to dominate some guilds and take control of the council and gain prestige points (other name for Victory Points). The player with the highest VP in the end of the 5th round win the game. The artworks of Strasbourg are quite good, it’s classic and yet colorful with the guilds icon. I am not too familiar with Alexander Jung, the artist behind the artworks. I did a background check and it turns out that he’s the artist behind Dominion : Intrigue & Seaside, Antigua and Antike. 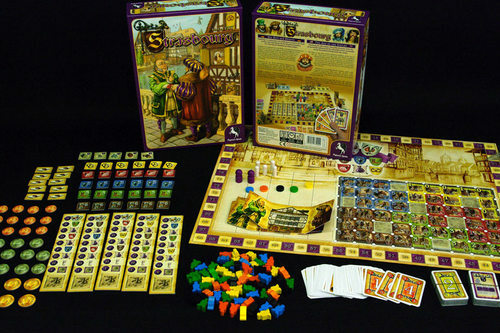 You’ll find in the box, a game board with nice illustrations, 5 round cards that represents 5 rounds, 5 edifice tiles, player screens, influence cards in 5 player colors (blue, orange, green, yellow and black), wooden family members in 5 colors, goods tiles contains 5 different goods (meat, armor, shoe, keg and bread), task cards, chapel markers, coin tokens (with the denomination of 1/2/5) and privilege tokens. Setup the board by placing the 5 round cards and edifice tiles in random. Put all the tiles and coins in empty space. Each player pick his color and receive it’s family members, influence cards and get 5 task cards that he will decide to keep the task cards or discard any (he must keep at least 1 task card). The game consist of 5 rounds, in the end of the 5th round the final scoring takes place. Each round has 3 phases (Planning Phase, Action Phase, Council Phase). In the planning phase, players must draw influence cards from their deck for the bidding purpose. The cards contain number range from 1 to 6 in 4 sets. Each player will drawn cards and decide how many to be drawn for the bidding purpose in that round. So, based on the 5 rounds, players must consider the planning of their deck for enough to be used in that 5 rounds length bid. After they drawn the cards, they need to separate the cards in several stacks (based on how many times they intent to bid in that round). These stacks may contain only 1 card or more, but must be openly visible to other players how many stack each player has and how many cards in each stack. These cards are put face down in the table and each player can freely check his cards anytime, but not rearrange it after this phase is over. Influence The Noble and The Church (A) – The 1st winner of the bid win the noble, the second win the church. Each place their family member in the council slot available (in the coat of arm of the noble and the church). Influence Guilds (B/D/F) – Each player will bid a certain guild that shown in the round card. Winner of the 1st place (Master) will gain 3 benefits which are he may place his family member in the corresponding guild in the council, take the corresponding good tile and then he may also place his family member in the corresponding place on the city by paying the price shown. The 2nd place (Journeyman) gain 2 benefits (after the master has already take his benefits) which are he may take the good tile and place his family member in the city. The 3rd winner (Apprentice) gain only 1 benefit, either he take the good tile or place his family member in the city. 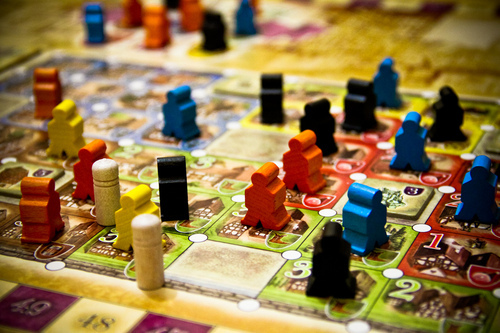 Influence Merchants (C/E/G) – Influence merchants mean that the only winner can sell his good tiles and gain coins. There are 3 chances to influence merchants in every round, but there last one will gain the winner a place in the council (merchants guild). Build Chapel – The player who won the 2nd place in the first bid (The noble and the church) get the chapel marker and put freely in the area on the city as he wish. Build Edifice – The players who has his family member in the council as the noble get the edifice and place it in one of the city empty spaces. Each player who sits out on the bid may place one of his influence card used to the bottom of his deck. The other player who won the bid (the winner) discard their influence cards into the box. The cards remain in the stacks in the end of each round will be discarded. In the last phase (the council phase), round scoring take place. The players gain prestige points by the amount of their family members on the council. The player with the most members on the council gain privilege token. The game continue into new round. Each player draw cards from their deck again in the planning phase of a new round. In the end of 5th round the final scoring take place. Each player scores 1 prestige points for every family member in the city, 1 prestige for every privilege token he has, gain prestige points from his completed task cards or minus 3 points from each incomplete task card. Gain bonus 1 prestige point for each member adjacent to the chapels, gain an amount prestige points based on each member adjacent to the edifices on the city. The player who gain the highest prestige points win the game. What’s good about this game? Well, i believe the game was built in great mechanics and it really offers great game play. The auction / bidding mechanic is unique by using influence cards that are drawn random. This give the players extra planning and risk taking by blindly draw the cards and plan their bidding phase of each round. Player must carefully observe other players need and interest so he can decide his objective in each round. This mechanic was surprisingly gave a nice risk taking and gambling element which made the game challenging and more interactive. The round cards and edifice also placed random in every game, this add more variant to the game. But the most powerful is the task card which add a great deal of variant and gives each player secret missions that needs to be completed. This task may put players in direct confrontation of the family member placement on the city which can be very challenging on the action phase (some players may pursuit the same guild and it may really decisive). I guess the game is already proved great and won’t be need any expansion if there will be. I like the game, after 2 plays i want to play this game again. It was fun and intense in the action phases and really looking forward for another game. The game play is unique and it offer you new experience of the bidding mechanic. Even the game is quite short (about 60 minutes) some of my friends said that this game is depressing and really tiresome. Well, not for me, i know how the pressure might come in the action process, but then maybe i was having fun and not feeling it. I understand the reason why they said so, i know the reason why the game is so depressing. It’s the relentless condition of which you don’t know what other players would put their influence cards in the stack. What numbers beyond their face down cards. It really gives you the itch that can only be subdued by resolving the bid. Or you can take several calculation based on other players position and what they after (by observing the city and the councils, but this not always guarantee that you will win the bid, cause when you can guess what other players intention, it’s usually too late. Too late cause the condition of your stacks for the bid this round cannot be rearrange and you can only hope your bid is high enough to outbid them. So overall, i like this game and wish that someday i can have a copy of this.